Why Vietnamese grilled cake – Banh trang kep is special ? 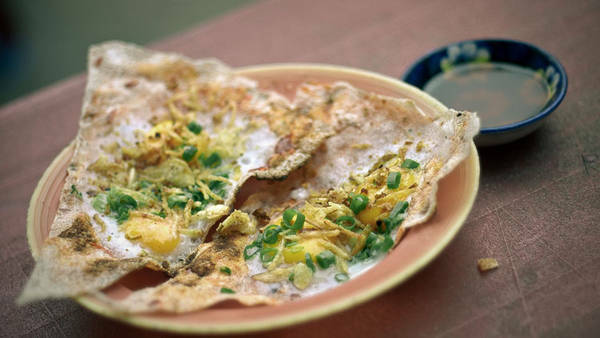 Listed as one of the top most attractive street foods in Central Vietnam, Vietnamese grilled cake – banh trang kep is a must for everybody visiting Da Nang, especially for youngers and students. Despite that it’s hot or cold, Vietnamese grilled cakes which are made from rice paper with fried shallots and quail eggs, dried beef or pork liver pate… always receive lots of love from the youth in Da Nang. It’s not easy to make these cakes but it’s easy to “eat” them. They are often served along with a special sauce which is made from chilies and dried beef. In the afternoon, the place is full of locals. The staff can not speak English so you can ask other to translate or point out food from the menu.